The government of Honduras has a public school system that provides free schooling through the sixth grade. Many of the remote villages we serve will, at best, have a one or two-room schoolhouse and one-two teachers for all six grades. Our experience, however, is that these schools are substandard in every respect: books, supplies, curriculum. Often the teachers go unpaid for months at a time. When a child graduates from the sixth grade, education stops for most students. Boys usually go to work in the fields with their fathers, or they gravitate to the cities for low paying jobs. Girls typically go home and help raise the children until they marry early and start families of their own. Marriages of girls at age 12-14 are not uncommon. 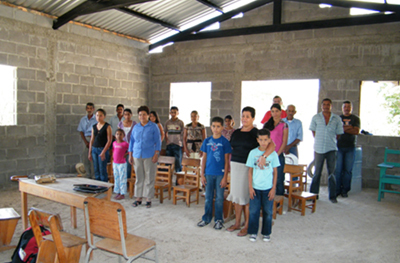 Education beyond the sixth grade (colegio in Honduras) is considered “private education” as the government does not require or provide education past primary school and these expenses must be paid by the parents. Families from these rural areas cannot afford the costs of this education. The Honduras Good Works Secondary Education Scholarship Fund requests $275 per school year per student which goes toward books, uniforms, school supplies, school fees, and transportation. Children who live close to a school will receive less, while those who live far away, may receive more, as transportation is the single greatest cost in achieving an education. Our scholarship does not cover the entire cost of going to school. Parents must contribute toward the cost, and we are careful to communicate that an education is not “free”, nor is it “charity.” We believe this shared cost approach ensures parents and students are making a commitment to education, to support the importance of attending classes regularly, studying at home, adhering to the program’s strict behavior criteria, and making the grades to pass to the next grade. The first three years of colegio are basic courses of science, history, etc; the last two to three years of the program are a student-chosen career track. If one completes a career track in education, the person is qualified to teach in a primary school. Therefore, completing colegio moves one from menial work to professional work. Most of the 7.8 million people in Honduras live in the many remote, mountainous villages throughout the country. 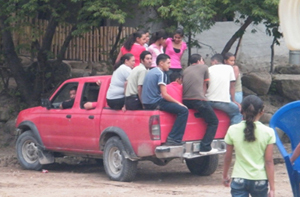 If a child continues school beyond the sixth grade, typically it involves a long walk down the mountain to the nearest road, hitching a ride with other students to the closest highway, then catching a public bus to the nearest city where the school is located, such as Danli, Yuscaran, Zamorano, San Pedro Sula, and Tegucigalpa. When class is over, the student repeats this route. It is common for the trip to require 3-5 hours a day just to go to school! Because of the difficulty and complexity of getting students to and from school from these remote villages, transportation costs consume most of the $250 a year needed for each student. Families must make hard choices about which child will continue school and who stays home. Students on a career track of high school often have to live away from home with friends or family in one of the larger cities, thereby incurring even more costs for families. The commute to school involves hours each way — walking, hitchhiking, and catching a bus on a main highway.